Of course, there’s a certain amount of routine worrying to be done between the time your scintillometer sounds off and the time your mine begins to complicate your income tax returns. 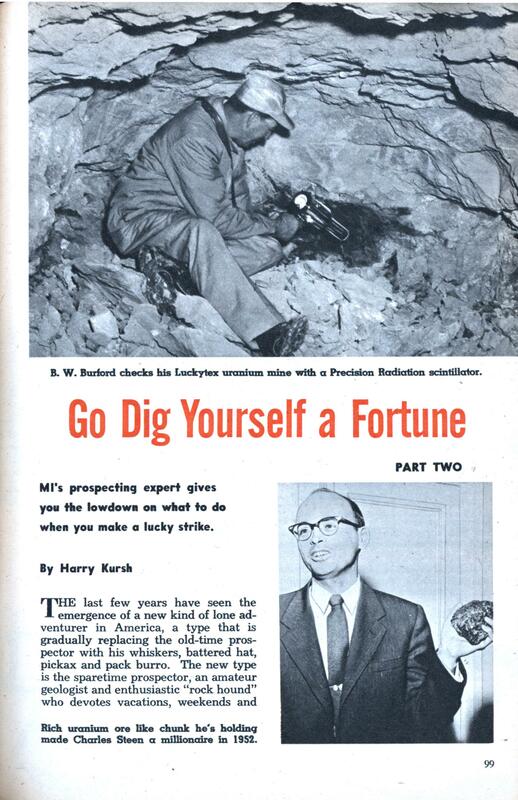 In the May issue of MI I gave out the low-down on how to be a sparetime prospector, as passed on to me by government officials and other experts in the field. If any MI readers were inspired to try spare-time prospecting themselves and need further instruction, here’s how to act when and if you stumble onto a mineral deposit. Federal and State Law. When you prospect on the public domain, where practically all valuable mineral discoveries are made today, you have to know how to deal with the Federal government. In almost every case, such dealings are with the Bureau of Land Management in Washington and its various district and regional land officials scattered mostly throughout the states west of the Mississippi. Under the mining and mineral laws, some of which date back to the California gold rush days, if you discover a valuable mineral on Uncle Sam’s lands you are entitled to claim the land. Then there are state laws to look into. Even if you’ve made a discovery on Federal property, nearly every state has its own regulations for staking out and record- ing a claim. If you want to make sure (1) that you’re not jumping an existing claim, and (2) that nobody will come along and jump your claim, you have to check with the appropriate agency in each state. A good way to find out where to make your inquiries is to check with the local Chamber of Commerce. Whatever the local rules are, that’s what you’ve got to follow. There are a few exceptions. The government reserves its right in all cases to control discoveries of coal, oil, gas, oil-shale, sodium, phosphate and potash. This also takes in sulphur found in Louisiana and New Mexico. If you found any of thse “reserved” minerals you’d have to apply for a lease to mine it and sell it. Terms of a mining claim. Once you stake an authentic mining claim, it’s all yours. You don’t even have to record the claim, unless the local laws require it. As for Uncle Sam, the property included in the claim is yours to sell, mortgage, lease, give away, provide for it in your will or mine it yourself. You have what is known as “possessory rights,” and no one, not even the Federal government (unless you were a fraud in the first place) can kick you off the land. You don’t even have to ask for a deed or what the government calls a “patent” to the land. Two kinds of claims. You may make a lode claim or a placer claim. When the mineral you discover exists largely as a “vein” in the earth, you’ve got a basis for a lode claim; if it has been washed away from its original place by the action of water, you’ve got a placer claim. The only thing that may matter to you is the value of the claim. But it is important to make the distinction, since the amount of land you can get in a mineral claim on the public domain is affected by whether it is a lode or placer claim. How do you stake a claim? In government language staking a claim means making a “location.” You do it actually by identifying the four corners of the area in which you claim you have made a discovery. The familiar picture of a grizzly prospector driving wooden stakes into the ground fits the bill perfectly. That’s just what you do. The point is that the area of your claim must be easily identifiable by anyone, including field investigators from Washington. Then you put up a sign (or as many as you like; the more the merrier) proclaiming that it is your claim. On the sign, you print your name, the number of your claim and whether it is a lode or placer claim. And just to stress the point to anyone with shady ideas, print in bold letters: “No Trespassing.” If it is your first discovery and your first claim, naturally it would go down on your sign as “Claim Number One.” But under the law there is no limit to the number of claims you may make. If your discovery is a lode claim, each claim is limited as follows: no more than 1,500 feet along the line of the vein, nor more than 300 feet on either side of the line that runs down the middle of the vein. If it is a placer location, you may stake a claim to as many as 20 acres. You are not essentially restricted to following the course of the vein, as in a lode claim. That’s because in a placer there is no real vein. Although the Federal government doesn’t care whether you record a claim, as long as you obey local and Federal rules, it is wise to record every claim. Always know exactly where each of your claims is located. If the land has been surveyed by the government, it can be described in terms of the official survey language, which is based on a method of subdividing land into townships, ranges, sections and quarters of acres. In cases of unsurveyed land, or in cases of small parcels of land, such as you get in each lode claim, you’d have to use the more familiar system of metes and bounds. Identifying land, especially when valuable discoveries may be involved, is a chore that is usually left to the experts. Locally, this may be a lawyer or a real estate broker or civil engineer. If you are anywhere near prospecting country you can be sure there will be no shortage of signs leading to expert help. Whenever in doubt about where to go or what to do, contact the district or regional land office of the Bureau of Land Management covering the area in which you are prospecting. BLM officials probably won’t be able to recommend you to any specific individual, but you can always count on them for guidance. Protecting your claim. After you make a location, if anyone contests your right to the claim you have to fight it out on your own in court. You get no help from Uncle Sam. That’s another reason why it is a good idea to record each and every claim. But if you don’t want Uncle Sam to declare your claim invalid, you have to perform what is called “assessment work.” This means that, under the law, for every claim you have you must perform at least $100 worth of work each year toward making the claim pay off. If you want to avoid complying with this rule every year you can apply to the Bureau of Land Management for a patent to the land. This will transfer the title from Uncle Sam to you. You can make the application any time after you are able to prove that you have spent at least $500 on the land. The expenditure can be in the form of labor or equipment. Your own labor, if honestly performed, can be included at the prevailing wages for such labor. This will cost you $2.50 per acre for placer claims and $5 per acre for lode claims, plus a $10 filing fee and some other minor expenses. If you get a patent, you have the world’s best land title. You practically eliminate any chance of having your claim “jumped” or invalidated by the government. But remember that you have “possessory rights” on any claim you make, whether it’s recorded with the county clerk or even if you never apply for a patent. Just keep up your annual $100 assessment work, obey state laws and you can cash in on the land and its minerals just as if you’ve had it in the family since Uncle Zeke stepped off the first stage that headed West. How do you cash in on a lucky strike? Even professional prospectors seldom go in for mining. The expert mining engineer is in a class all by himself. He may not know anything about prospecting, but he usually knows how to exploit an ore discovery, how to get it out, how to get the most for his investment In a mine, and how to ship it to industrial customers. In other words, he’s a technically equipped businessman. It’s a rare prospector who is. Chances are that you as a sparetimer will not want to go into the mining business. But don’t worry. Once you’ve made a strike it won’t take long for the word to get around. The scouts for major mining companies will be along, each carrying a proposition, before you can write home and tell the folks about it. Can you get help from Uncle Sam? Yes, in more ways than one. The big problem after making a discovery, for instance, is to determine how valuable it is. Often this calls for more than a simple assay test. It calls for actual exploration, drilling and digging shafts, on the site of the discovery. This means know-how and equipment. About three years ago the government realized that if it wanted to’ keep its vast armaments program going full steam, something should be done to make sure there are enough of the vitally needed minerals on hand. To do this the White House set up a brand new agency, the Defense Minerals Exploration Administration. The job of the DMEA is to encourage new mineral discoveries and to help explore them for Uncle Sam’s stockpile. The DMEA has a list of some two dozen minerals, which it considers strategic and handy to keep in the stockpile. If you should discover any one of the minerals on this list, the DMEA will enter into a contract with you and will pay up to 75 per cent of the cost of further exploration, depending on the mineral you’ve found. But don’t expect a grubstake to go prospecting. You’ve got to do the prospecting first, make your discovery, prove you’ve got a legal interest in the discovery, and then you can turn to the DMEA. Since 1951 DMEA has executed more than 600 contracts and has put up aid to the tune of nearly $19,000,000. In these days of astronomical budget figures that may seem like chicken feed. But to the prospector who once had to put up or give up, it is the most important money in the world. When the DMEA was first created, leading mine spokesmen called it boondoggling socialism. Today, some of these very same critics are quietly making applications for DMEA aid. If you apply for a DMEA contract, you’ll most likely get a visit from DMEA field experts. They will determine whether your discovery shows any signs that warrant further exploration. If you get a contract and you strike it rich, you have only to pay back to DMEA the amount you borrowed. If the exploration is a failure and nobody makes money, you can mark Uncle Sam’s loan off on ice. You get a polite letter expressing regrets all around and, in effect, wishing you better luck. You don’t have to write to Washington to deal with DMEA experts. The agency has field offices scattered around the country. To know where these field offices are, and to learn more about the DMEA program itself in layman’s language, write to C. O. Mittendorf, Administrator, Defense Minerals Exploration Administration, Washington 25, D. C., and ask for this booklet: The Defense Minerals Exploration Program. When you have staked your claims, recorded it, explored it and contracted with someone to work it, it may strike you that this has become a serious fulltime occupation. Where are the carefree joys of long ago when you were just a sparetime optimist with a Geiger counter? Cheer up— it’s not so bad. There’ll be the money to make up for the loss of freedom!